It may come as a surprise to no one that I loves me some science fiction. Like many, I grew up with the Star Wars and Star Treks as part of my entertainment regimen and have followed those up with countless hours of whatever current sc. Beacon promises to deliver on that sci-fi fantasy itch in that the game only exists as a small part of an overall universe. With implications of a much larger story operating just behind the backdrop, I am further pulled in looking for hints of the grand design. 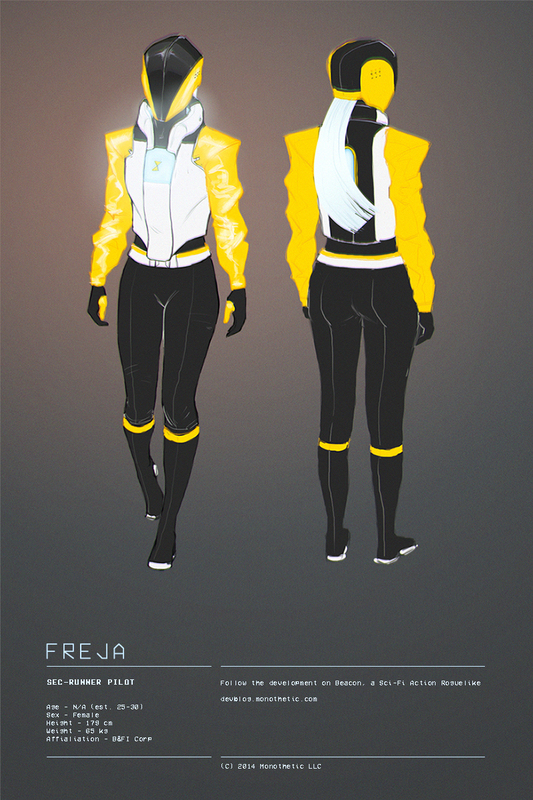 Predictably, game specific details are scant as this is still a work in progress (the main protagonist's name appears to be Freja). That doesn't mean we can't investigate a little to see what more we can discover. Tell me the story of Monothetic. Taychin Dunnvatanachit : That’s definitely a long one. I would say we really started back when I was making Canvas (a story-driven Half Life 2 mod which was way too ambitious, and ultimately doomed) alongside some great people. When the mod finally died, a few of us went on to form Monothetic. The real catalyst for everything, at least for me, was taking Black Snow (another story-driven Half Life 2 mod) from concept to release; it convinced me that we had the mettle to ship a product, and gave me the confidence to push forward with the idea of doing a commercial game. We’ve been working as a team for a year now, and I believe that we’re finally achieving a good level of mutual understanding. The actual team is split between North America and Europe, half of us are in the UK and the other half in California, so trying to organise regular meetings can be interesting, but I think that also affords us a more international perspective. Arran Seaton: Most of us originally met through the Half-Life 2 modding community several years ago, primarily through Interlopers.net. As Tay mentioned, we began collaborating on projects here and there, and slowly started to form as a collective. Monothetic is an extension of that ongoing relationship between the founding members of the team and the desire to create interesting projects together. There’s heaps of talent to be found in the individuals that make up our company and I think we felt it was finally time to prove it as a group on the commercial level. Would you please be so kind as to introduce your project currently titled Beacon? Joseph Russell: We’re currently pitching Beacon as a Science Fiction Rogue-like, where you have to mutate your way to victory through repeated cloning. You’re stranded on a planet that you’re not familiar with and forced to scrounge what you can in order to construct a distress beacon. At the same time, you’ll be picking up weapons, items, and choosing to collect DNA from the enemies you defeat. When you die (it’s a rogue-like, you will die), you’ll lose everything you’ve picked up and start from scratch, apart from the DNA you’ve collected. That gets fed into the cloning bay back at your crashed ship, which alters your genetic makeup on a permanent basis. You are given different stats and, eventually, physical mutations to aid or even potentially hinder your progress. It also makes use of it’s own risk/reward system, correct? Kiefen Zipf: Yes. Currently, the cloning is designed so that you gather DNA from fallen enemies to influence your next generation clone. The DNA you harvest each life will give stat boosts for your character, such as increased health or accuracy. The more DNA you acquire though, the more unstable the cloning process becomes and the more likely you are to receive a mutation. Mutations can have both negative and positive effects and will persist throughout all future clones in the current clone string. Of course if the player receives an extremely unfavorable mutation they can choose to reset the clone string, but all acquired stat boosts will be lost. Kiefen : It would be cool to set up Beacon to support Steam Workshop at some point but currently we’re not developing the game with that in mind. Although near-permadeath is a relatively common practice in games, the cloning/DNA conceit is a wonderfully new take. What was the impetus for that? Arran: The cloning/DNA aspect was actually Joe’s initial pitch. Knowing that a bunch of the team had a lot of love for the rogue-like genre, we decided to each go away and come up with a personal pitch for what we would want to see in the game. Bizarrely, the idea I pitched ended up being almost exactly the same as what Tay and Kiefen came up with, without any inclination of what they were thinking. Which was great of course; it meant we were on the same wavelength. But we still needed a hook to hold it all together. Joe lumbered out of his writers cavern to suggest the cloning idea. Joe: Those initial brainstorming sessions were a bit hectic. We went from nothing to a pretty fleshed out game idea in a very short space of time, and think my cloning idea came about by just taking a break from all the talking. Most of all, it came from looking at things that featured heavily in rogue-likes, but weren’t necessarily seen as part of ‘the game’. Death and restarts are really common in rogue-likes, but they’re not really intended as part of the game play loop a lot of the time. Most of the time they’re a necessary side effect of learning the systems and flow of the game. Trying to find a connection between the idea of frequent deaths and the Science Fiction genre obviously led to the idea of cloning. The DNA-harvesting aspect was added as I worked it through in my head, in an attempt to make cloning mechanically interesting as well as being a useful narrative conceit. Many games have been released or are in development that claim rogue-like attributes: items/characters/levels/enemies are procedurally generated and permadeath. What does the term “rogue-like” mean to Monothetic? Kiefen: To me, rogue-like means that the experience is consistently unique and the game is highly replayable. I share Edmund McMillen’s view that rogue-likes are becoming our generation's arcade games in a way. Although maybe for different reasons, you can replay them over and over and over. With the rising popularity of Twitch you can even emulate the social experience of going out to an arcade and having your friends watch over your shoulder but on a much larger scale. Arran: We are well aware roguelikes are ‘in’ with the indie scene at the moment, with everybody wanting to take a crack at it. I feel our game will stand out due to the sum of all its unique parts. The artstyle has a strong identity that I haven’t seen much of before. The music I’m making for it is a mixture of 80’s inspired synthwave and ambient electronica. We have an interesting hook with the cloning conceit and a well-realized game world. There’s also a bunch of other stuff we have yet to mention which, from a game play standpoint, should help Beacon stand out in neat little ways here and there. We’re excited to reveal more about it as we move further into development. If done right, rogue-likes can be the perfect cocktail of ingredients. Their randomized nature means that each run spits out a new set of challenges. In a way, the game always stays one step ahead of the player, since they can’t completely anticipate the outcome even if they master the rules of the game. If you can strike a good balance of the unknown (randomized procedural generation) with familiarity (strong, systemic game play mechanics & world rules) the results are endlessly satisfying. It’s an immediate and ever-changing feedback loop between the player and game. To add to what Kiefen said, I can’t overstate the popularity of Let’s Plays and Twitch streams that have helped gain mass interest in the genre. The two go hand-in-hand so perfectly. There’s a real sense that it evokes a strong connection between the audience & player. You are both in the same position, you both have no idea what could happen next and it makes for some really great content! I'm guilty of putting some Let's Play footage out there but I would love to get your opinion on Let's Plays as a studio. Personally, I see the relationship reciprocal and healthy as each side gets a little something from the exchange. Arran: It can be great exposure for fledgling developers who would normally find it difficult promoting their work, with little to no marketing budget. The Let’s Play community definitely has a powerful platform to help support the work, whilst also generating new content for their channels. However, both parties need to take responsibility for how they want the content perceived and presented. LPs are a grey area right now, causing all sorts of controversy. Since it’s a form of transformative media with no real established rule set between the content creator/developer for what’s 100% acceptable, but, everyone has their own stance on the matter. Although only just revealed, Beacon looks to be informed by a very specific and rich lore. Can you go a little more in-depth about the world surrounding it? Tay : While I would defer most of this to Joe I would like to chime in and say that I am very happy with how we’ve built narrative as one of the development pillars. It’s not all that common to have that kind of thing in rogue-likes, but I think having a shared vision in this regard helps the team maintain a cohesiveness when developing the world. Joe: Beacon’s universe is very reminiscent of the classic space opera sub genre of Sci-Fi. Space travel is commonplace, humanity is spread across countless solar systems, and corporations and governments have become pretty much interchangeable. There are also hints of fantasy in the world, where elements of ancient superstitions and legends have turned out to actually exist in the fringes of space. However, all of that is very much in the background of Beacon. We have a lot of back story and information on the universe that will never be seen in-game, but will be used to inform the writing that does make it in. We’re telling a very small story of one person trying to make it off a hostile planet, and hopefully hinting at the larger universe through environmental storytelling will lend the world a depth that reading a full historical account wouldn’t achieve. From what inspirations do you draw? Joe: I don’t think this question can be honestly answered by anyone making a Sci-Fi game without mentioning Alien. More specifically to Beacon, however, Moon and Primer inspired a lot of (and this is a spoiler, so anyone that hasn’t seen the films should skip this paragraph) the cloning aspects in the game. In terms of more general world-building, I’m constantly returning to Ray Bradbury’s The Martian Chronicles, and the depictions of future society seen in A Scanner Darkly and Brave New World. As for games, The Binding of Isaac and Nuclear Throne are our closest touchstones, but there’s also a lot of Spelunky appreciation going into the game design. From the few screens you have released, the visual style of Beacon is very clean and somewhat sterile (in a futuristic sense). What influences your art direction? Tay : There are many things that have influenced my art direction throughout the years, but you would definitely be right to assume that there is a tendency towards a futurist aesthetic. In a strange way, the aesthetic of Beacon developed from my interests in interface design. Interfaces need to deliver information in a very clean and concise manner, a functionalist design if you will, like the works of Dieter Rams. In my opinion there is a tendency, in both films and games, to overload the audience with information; to generate an armada of moving compartments on-screen, and sculpt everything down to the last detail. I do not enjoy that kind of aesthetic; to me, minimalism is more interesting because it requires us to practice restraint and only say what is necessary, and that in itself is a tenet that applies to all of our design philosophy. With such rich canon, have you considered supplementing the game with another expository medium such as graphic novels? Joe: It's definitely something we've thought about, but ultimately our number one goal is to make the game. I would love to go back during some downtime after release and maybe revisit the idea, but at the moment it's just not on the cards. You mentioned the music of Beacon and I think 80's-era Sci-Fi is an excellent example to follow, especially now that we have eclipsed much of what the past expected the culture of the future to be. How accurate do you think some of those musical predictions were? Arran: I think we’re getting to the point where, with music, it’s unlikely we’ll witness some revolutionary new genre pop out of nowhere. The innovations are getting smaller and smaller, and musicians/producers are either looking back to previous generations of music to find inspiration or are attempting unorthodox cross-pollination of genres. If you look back to, say, the first time electronic music and synths started getting introduced, or when Hip Hop began exploding out of New York, or Heavy Metal being established by Black Sabbath. Those were landmarks of music. Music which people had never heard or thought possible before. I’d like to be wrong, but I don’t expect we will see anything quite so significant with music in the future. The Internet and this mass interconnectivity we take for granted has changed so much of how we consume and share content, nothing will quite have that same impact of discovery again. What role does music play in the game? Does it reference any particular film or other music? Arran: I hope for it to play a fairly significant role. I am aiming to create a soundtrack that can hold up to scrutiny in isolation, but also compliment the themes, aesthetic and atmosphere of the game. I personally love pretty much all genres of music, So I probably subconsciously get inspiration from all sorts of weird places. But for Beacon, the main pool I drew from was Synthwave. Acts like Com Truise, Pilotpriest, Carpenter Brut, Protector 101, Kavinsky, Miami Nights 1984, GAMES, etc. It’s a modern genre that’s purely evocative of the 80s synth soundscape, but applies more realised modern production methods and sensibilities to it. The genre also takes a lot of cues from Sci-Fi of that era, as popularized in movies - Cyberpunk, Lo-Fi/Future-Retro & post-apocalyptic - which is more tonally the spectrum of Synthwave I’m interested in for our game. There’s certainly some of the 70/80s horror vibe creeping in for good measure though! Do you see a difference in Indie culture between the U.K. and the U.S.? Tay: I’m from Thailand, whose Indie scene is still very marginalized, and I’ve never been too involved in the U.K. scene so I can’t really speak much for this one. I would say though, that the Indie culture in the U.S. is comprised of so many nationalities that it can give you a very varied output, which I think is a good thing. Here I’ve met Norwegian, Indian, U.K. devs... you name it - but that might be a reflection of San Francisco more than the U.S. as a whole. Arran: The Indie scene in the US has grown pretty rapidly over the last 5-10 years. I think that’s partially due to the nature and size of the country. Everything operates on a much larger scale, meaning much bigger communities can form and thrive in their own respective regions. It’s matured to the point that some developers are even branding their games with a “Made in *State*” emblem. There are also just far more events throughout the year & really unique occasions like Train Jam or studio spaces like Glitch City LA for Indie developers to attend and interact with each other. The U.K. isn’t quite there yet. Though there are definitely some cool events like The Wild Rumpus and Game City, it has yet to be nurtured in quite the same way. I think this is partly down to the (comparatively) small size of the country, and how the industry here has been pretty fractured. A lot of studios have closed over the years due to financial struggles, meaning it’s been harder for communities to grow around them and feed off one another. It’s definitely made it more difficult in general for a lot of people to even consider independent ventures, since there’s no real driving force behind one particular scene yet to help support you. It’s beginning to pick up though and I expect it will soon start to follow in the footsteps of the US. From what you've mentioned, your first projects were just Half Life 2 mods. How was that experience different from building a studio and releasing a full-fledged game? Tay: There is a huge difference superficially, but I think the fundamentals remain the same. I say that when you release a game, whether it be for free or commercially, there are some things that remain constant such as a commitment to quality, good internal planning, et cetera. I think that’s why a lot of modders transition well into full-time development jobs. With Black Snow, a big difference was that there was no real financial stake. While the team was involved, it started off as a personal project for me before I decided to include everyone. Black Snow was also much more personal in the sense that I really had to prove to myself I could take something from concept to completion after the failure of Canvas and NightFall. As you can see, I’ve failed a lot, (laughs) but I definitely did not stop trying. The mod was kind of a love letter to old school survival horror games as well as being my personal gauntlet. I was totally unprepared with how well-received it was - in my head I would’ve been content with it just having been shipped out the door. I think that gave me the maturity and confidence to feel like I can be a part of a team, and bear that responsibility of shipping a commercial product. There are also a lot more factors involved when building a studio that we had to learn on the job, but in the end I think we’ve been adapting quite well. I’ve definitely learned to plan better and be more organised so that’s always a good start (laughs). Arran: I’m probably the odd one out here as this will technically be my 3rd commercially released product (laughs), but I know exactly what Tay is talking about. For mod teams, there are no real pressures or consequences if they never finish their projects. A few people following the mod may get disgruntled, but that’s about it. That lack of drive or structure really affects how amateur/freelance teams function, and I’ve been there many times myself in the past. As soon as you realise ‘we actually have to release this, otherwise we’re screwed’, It puts real-world responsibility onto your shoulders. You know that you can’t fail on this one. For me, my time working on the AAA side of things has allowed me to gain a lot of perspective and learn all the intrinsic details about development. I’m confident that I can now apply all that knowledge into Beacon and any other projects Monothetic will produce. I feel like I have to prove to myself that I can succeed on the smaller scale, I want to take that risk and not rely on the safety net that is a full-time studio job. That sounds crazy right? Throwing away financial security for something that may not even work out! But this is where my heart belongs, pouring my creativity into these awesome games I really care about. More information about Beacon can be found on Monothetic's devblog. They can also be reached on Facebook and Twitter.